The recent increase in the variety and functionality of materials and the innovations in the application techniques invigorated the conservative efforts within dental prosthetics to achieve natural looking aesthetic results. Porcelain laminate veneers are very effective tools in terms of both aesthetic and functional rehabilitation. This study narrates and explains the clinical application and cementation stages of porcelain laminate veneers techniques. 1. Stappert CF, Stathopoulou N, Gerds T, Strub JR. Survival rate and fracture strength of maxillary incisors, restored with different kinds of full veneers. J Oral Rehabil 2005; 32(4):266-272. 2. 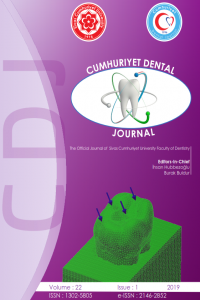 Gresnigt M, Özcan M. Esthetic rehabilitation of anterior teeth with porcelain laminates and sectional veneers. J Can Dent Assoc 2011; 77:b143. 3. Choi YS, Cho IH. An effect of immediate dentin sealing on the shear bond strength of resin cement to porcelain restoration. J Adv Prosthodont 2010;2:39-45. 4. Peumans M, De Munck J, Fieuws S, Lambrechts P, Vanherle G, Van Meerbeek B. A prospective tenyear clinical trial of porcelain veneers. J Adhes Dent 2004;6:65-76. 5. Wiedhahn K, Kerschbaum T, Fasbinder DF. Clinical longterm results with 617 Cerec veneers: A nine-year report. Int J Comput Dent 2005;8:233-246. 6. Kelly JR, Nishimura I, Campbell SD. Ceramic in dentistry: History and historical roots and current perspectives. J Prosthet Dent 1996; 75(1):18-32. 7. Walls AWG, Steele JG, Wassell RW. Crowns and other extra-coronal restorations: Porcelain laminate veneers. Br Dent J 2002; 193:73-82. 8. Gürel G. The science and art of porcelain laminate veneers. BadenBaden Germany, Quint Pub Co. 2003; 231-324. 9. Dumfahrt H. Porcelain laminate veneers. A retrospective evaluation after 1 to 10 years of service: Part I-Clinical procedure. Int J Prosthodont 1999; 12:505-513. 10. Vafiadis D, Goldstein G. Single visit fabrication of a porcelain Laminate veneer with CAD/CAM Technology: A clinical report. J Prosthet Dent 2011;106:71-73. 11. Choi YS, Kim SH, Lee JB, Han JS, Yeo IS. In vitro evaluation of fracture strength of zirconia restoration veneered with various ceramic materials. J Adv Prosthodont 2012;4:162-9. 12. Murphy E, Ziada HM, Allen PF. Retrospective study on the performance of porcelain laminate veneers delivered by undergraduate dental students. Eur J Prosthodont Restor Dent 2005; 13:38-43. 13. Chen JH, Shi CX, Wang M, Zhao SJ, Wang H. Clinical evaluation of 546 tetracycline-stained teeth treated with porcelain laminate veneers. J Dent 2005; 33:3-8. 14. Aykent F, Üşümez A, Öztürk AN, Yücel MT. Effect of provisional restorations on the final bond strengths of porcelain laminate veneers. J Oral Rehabil 2005;32:46-50. 15. Meijering AC, Creugers NH, Roeters FJ, Mulder J. Survival of three types of veneer restorations in a clinical trial: A 2.5-year interim evaluation. J Dent 1998;26(7):563-568. 16. Hui KK, Williams B, Davis EH, Holt RD. A comparative assessment of the strengths of porcelain veneers for incisor teeth dependent on their design characteristics. Br Dent J 1991;171(2):51-52. 17. Piemjai M, Arksornnukit M. Compressive fracture resistance of porcelain laminates bonded to enamel or dentin with four adhesive systems. J Prosthodont 2007;16(6):457-464. 18. Breschi L, Mazzoni A, Ruggeri A, Cadenaro M, Di Lenarda R, De Stefano Dorigo E. Dental adhesion review: Aging and stability of the bonded interface. Dent Mater 2008;24:90-101.